Workers setup camp and live in close proximity to the carnival grounds. At night, a man prepares for bed in his tent while the Ferris Wheel illuminates the surrounding area. At each carnival location, workers are usually assigned to a specific ride, food stall, or game for the week’s duration. As night falls, a carnival worker waits for visitors to play her game. When the carnival is open, workers usually attend to rides or games from noon until midnight. A girl “poses in a bikini” as carnival workers setup a ride called the “Ice Storm.” Teamwork and communication are essential to preclude an accident from happening. Working on the carnival rides is extremely dangerous. This carnival worker accidentally dropped a 70-pound metal panel on his toe. Several other carnival workers look on in amazement as he awaits a ride to the hospital. Two carnival workers awake and rise. This is the belly of the tractor-trailer that transports the Merry-Go-Round. After rides are erected, workers oftentimes use the trailers as shelter. The traveling carnival has a tractor-trailer that is outfitted with 8 individual rooms that act as sleeping quarters / living areas. This married couple shares one of the rooms. As the man sits on his front step and smokes a cigarette, his wife comforts him. Carnival workers are trained to “bark.” Barking involves having a phrase or action that entices passers-by to acknowledge the game and worker. Here, a game operator strategically knocked over some balls and asked the boys to help pick them up. 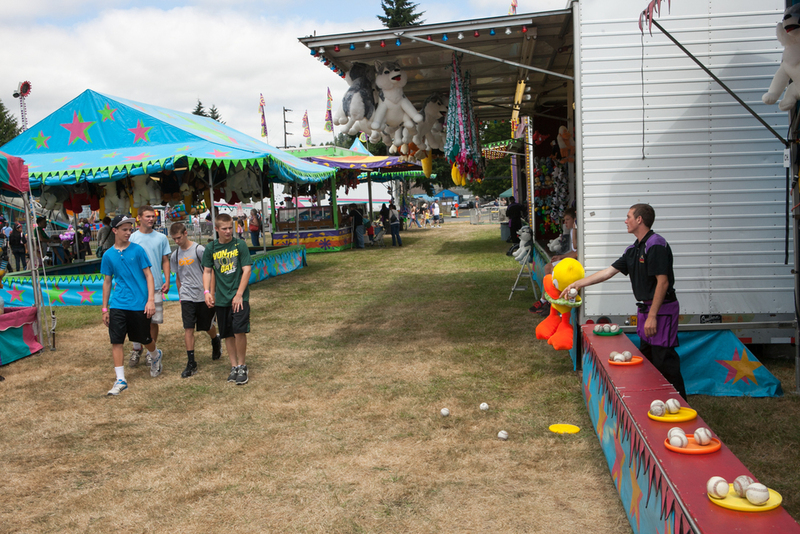 As the boys come closer, the carnival worker will engage them and entice them to play, thus getting them to spend money. The carnival workers setup a camp with their vehicles, tarps and lounge chairs. With that kind of environment, a good shower is usually hard to come by. One carnival worker washes her hair with water (from a nearby jug) and rinses it with more water from a plastic container. Carnival workers oftentimes travel with their families. Therefore, living and working quarters are rarely separated. In the carnival camp, two recreational vehicles are parked within close proximity to each another. A husband and wife argue while children play near them. After carnival setup is complete, one carnival worker uses her rare free time to traverse an open field towards a nearby river. She drags her air mattress that will soon double as a floating raft. This is a typical “carny cookout.” Oftentimes carnival workers are living out of their cars and trucks while moving from one location to the next. Therefore, they usually purchase non-perishable foods. Two workers attend to a can of food on the grill, while a third worker opens another can with a knife. Five carnival workers (one man in the foreground, two couples in the background) spend some free time in a local bar. As the man sits at the bar, the two couples each engage in a kiss. It is quite common that families travel together with the carnival. In camp, one woman observes her neighbors - a mother and daughter - through the window. The carnival usually travels during the summer months, so the workers’ children are not in school. As the carnival’s Ferris Wheel is dismantled and prepared for movement, the daughter of two carnival workers sits in a van and awaits the journey to the next location. For more than 100 years, traveling carnivals have roamed the American landscape and entertained people from all walks of life. Davis Amusement, which has been in the carnival business since 1947, is based in Nevada, but in the summer months, the carnival plays throughout Oregon, Washington and Montana. The workers who make everything possible are usually overlooked by society and seen in a negative light. Yet they are real people - husbands, wives, parents, employees.